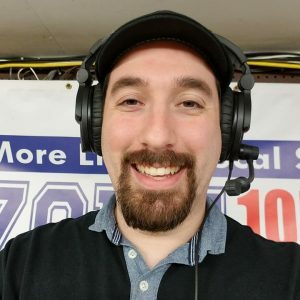 “Our odd couple in the morning,” Travis and Sherman help listeners start the day with laughter, knowledge, and connection as they share local news, sports, traffic and weather updates. Listeners are educated and entertained with high quality interviews with area officials and community guests and the Quiz Question of the Day. 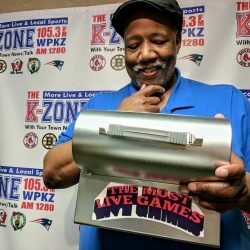 Long-time Worcester and Boston radio news and sports personality Sherman Whitman joined the K-Zone as co-host and sports anchor in 2016. Sherman, a resident of Fitchburg, spent four years with WCRN AM 830 and the two years as the play-by-play voice of Worcester Bravehearts. Prior to his time at WCRN, Sherman was part of the news and broadcast programming at WTAG in Paxton, Mass and WBCN and WKLB in Boston. On a favorite sports moment, Sherman points to his 2002 coverage of the Jesse Burkett League Little League All-Stars’ appearance in the Little League World Series in Williamsport, PA, and the ensuing parade in Worcester for the local stars. Born and raised in Leominster, Massachusetts, Travis is a Leominster High graduate (Go Blue Devils!) and a graduate of Bridgewater State University (Go Bears! ), where he discovered his love for radio. He went on to intern and later work for The Loren and Wally Show on WROR in a variety of roles. His first morning show on-air gig began right here on WPKZ before heading south to Virginia to host an afternoon show on 92.9 Kickin’ Country (Yeehaw!). Being a glutton for punishment, Travis has moved back north because he missed New England winters. Now he’s thrilled to join listeners on The K-Zone Morning Kommute every morning, discussing issues important to the area. In 2016, Travis won a Massachusetts Broadcasters Association award for his radio tribute to the legacy of longtime WEIM/WPKZ radio host “Ray C” – a passing on the baton of sorts from one community-loved host to the next. In his spare time, Travis enjoys hanging out with his dogs Ollie and Bandit (we aren’t sure if the feelings are mutual) and swing dancing at the Elks with the wifey.